Engineered bacteria to combat malaria! According to the WHO World malaria report 2011, there were about 216 million cases of malaria and an estimated 655 000 deaths in the year 2010. Most deaths occur among children living in Africa where a child dies every minute from malaria. A team of scientists at the Johns Hopkins Malaria Research Institute have genetically modified Pantoea agglomerans, a bacterium found in the mosquito's midgut to secrete proteins toxic to the malarial parasite. These toxins do not harm the mosquitoes or humans, but inhibit the development of malarial parasites. They have found that these engineered bacterial strains inhibited the development of Plasmodium falciparum and P. bergheby (rodent malarial parasite) by up to 98% within the mosquito. 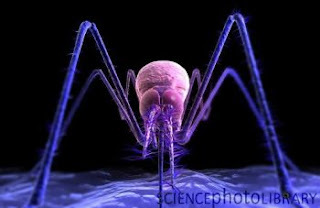 They also found that the proportion of mosquitoes carrying the parasites decreased by up to 84%. The findings of this study is published in the PNAS (July 16, 2012, doi:10.1073/pnas.1204158109). This research has demonstrated the use of an engineered symbiotic bacterium to interfere with the development of P. falciparum in the mosquito and these findings provide the foundation for using genetically modified symbiotic bacteria as a powerful tool to combat malaria.